At the top of the High Street, next to St Mary’s Churchyard, is The Star and Eagle. The property dates back to 15th century when it is believed it was a monastic building connected to Combwell Priory. It became a coaching inn, called “The Black Spread Eagle”, in the 1600s. Over the years it has changed its name twice, from The Black Spread Eagle to Ye Olde Starre and Crowne, then to The Star and Eagle. It has also undergone major restoration and refurbishment and has been extended into neighbouring properties, Lloyds Bank and The Eight Bells, to become the prominent black and white timbered building it is today. First the coach passageway from the High Street to Back Lane was closed to create an additional bar, then the building next door, formerly Lloyds Bank, was taken over to provide additional dining space. A number of landlords have come and gone. In 1841 the census shows Richard Austen there with his wife, Louisa, and their family but by 1851, William Doust was there with his wife, Catherine, and their family. However, the directory for 1851 shows Mr William Bearsby at the Starre and Crowne. In 1861 Edward Austin was landlord with his wife Frances, and in 1871 Frederick Fry is listed on the census with his wife, Rose, and their family. We know Frederick was there from 1864 until 1905 and during his ownership he was responsible for much of the refurbishment work. Mr A H Thomas is listed as landlord on the 1911 census and the 1914, 1915 and 1916 directories. The next landlord we know of was Mr Harold Nicklinson. He lived here with his wife, Muriel, and their family. Harold was tragically killed in a gas balloon explosion in 1925. Shortly after his death Muriel and her young family moved across the road to Church House. In the 1938 and 1939 directories the proprietor was shown as Mr Jack Pickering. However, in 1939 the new owner, E H Kelsey (Brewer) of Tunbridge Wells, commissioned a local architect, Mr H Benians, to design a reconstruction and extension for the pub. The now familiar black and white Tudor façade replaced the original half timbered and brick facade. 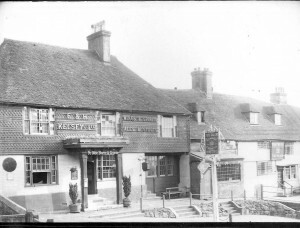 The pub reopened in 1940 with a new look and a new landlord, Arthur Alfred Holt and shortly after the name of the pub was changed to The Star and Eagle. The 1948 directory still shows Mr Holt as landlord. In more recent times, the Star and Eagle has been extended further taking over the old Eight Bells premises. This building is no longer a separate property but it is easily identified by its protruding square bay window. At one time it was a house and shop but today it has been incorporated into the Star and Eagle as additional dining space. In 1841 the property was the home of Samuel Beeching, a carpenter, his wife Sarah and their family. By 1851 Samuel had died and his widow, Sarah, is described on the census as a baker and farmer. In 1861 Sarah was still living there and working as a master baker with her son, John. Her son, Samuel, had started his own business as a corn dealer on the opposite side of the High Street. By the time of the 1871 census Sarah had died and the property was now occupied by Thomas Haylor, a builder’s labourer, his wife Charlotte and their two children and three boarders. Charlotte is listed as a huckster and was running a shop there. The 1881 census shows Thomas and Charlotte running a green grocer’s shop and having two lodgers. Ten years later they are both still there and, at the ages of 64 and 59 respectively, they are still running their shop. Local folklore has it that the shop was more of a pawnbroking business with Thomas earning the nickname Tommy Joey. Thomas also had the reputation of being the village’s best poacher. In 1908 Mr William Nash of Cranbrook purchased the freehold of the house and shop. By 1910 Mr George Butler was the tenant and he was running a general shop with his wife Rosa. They had their six children living with them. In the 1920s the property became the offices of the local architect, Mr H Benians, who was later commissioned to reconstruct the Star and Crown, now the Star and Eagle. Mr Benians moved out and Lloyds Bank took over the property, hence the name the property is known by locally, until trading ceased and the building was sold to the brewery in order to extend the Star and Crown. The façade was not changed when the building work was carried out and the familiar protruding square bay window is still easily recognised. This is a 15th century property which was converted to an inn in 18th century. It was named in celebration of the new church bells in 18th century. It is thought that the owner at the time may have been a bell ringer at St Mary’s church. The 1841 census shows Richard Harris, a watchmaker, living at the property with his wife Ann and their family. In 1851 Richard was still working as a watchmaker but Ann was now shown as a beer house keeper. Their son, Alfred, was 18 years old and was shown as an apprentice watchmaker. Ann’s 85 year old mother, Charlotte, had also moved in with them and was helping to look after the house and run the beer shop. Watchmaking was a family occupation and was carried down from father to son. Richard and Ann’s older son, Walter, was also a watchmaker in Goudhurst. By 1861 Thomas Boxall had moved in to the Eight Bells with his wife, Jane, their two daughters, one son and five lodgers. Some of the lodgers were employed by Thomas to help to run the pub. By the time of the next census, Thomas had left the pub and he and his family had moved to Benenden where Thomas was a gardener. In 1871 John and Harriett Giles were at the Eight Bells running a “common lodging house”. At the time of the census they had their four children and John’s father living with them as well as seven lodgers. By 1881 John had died and Harriett was running the pub and lodgings alone. She now had five children of her own and nineteen lodgers with three children between them living there. In 1891 Harriett was still there with three of her now grown up children and thirteen lodgers. The 1901 census shows that Harriett was no longer at the Eight Bells. Her son, Albert, had taken over as landlord. Albert had married a local girl, Emily Brabon and had moved to a cottage in Stoney Lane with her. But, Emily had died in 1899. Albert then married another local girl, Lily Weekes, in 1900 and moved back to the Eight Bells with his new wife and the two children from his previous marriage. Albert’s brother in law and sister in law, William and May Weekes, were living and working at the pub too and there were just two other lodgers there. Albert and Lily were divorced in 1909 and in 1921 Albert died. 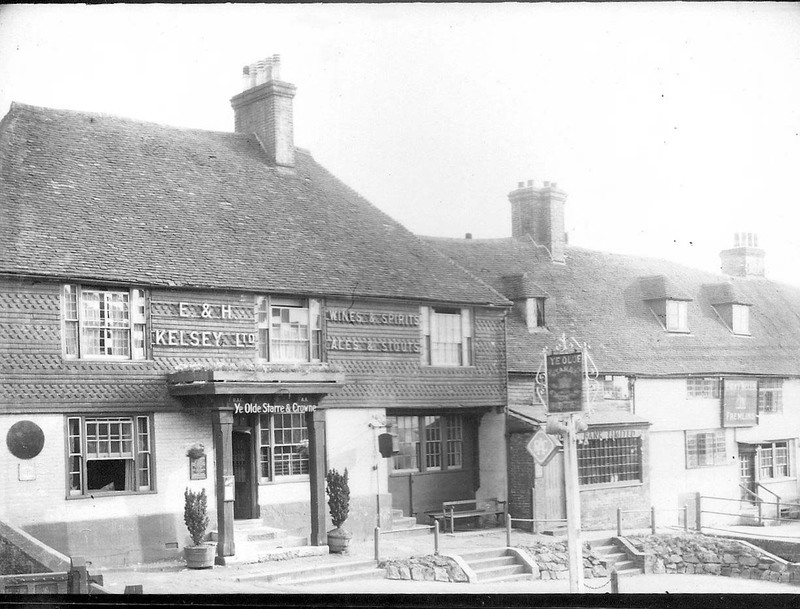 Following Albert’s death, his son-in-law and daughter Percy and Daisy Blaxland took over the Eight Bells. Percy died in June 1944 , but Daisy stayed on there until 1950 when Sheila and Ernest Maxwell, her son-in-law and daughter, took over. Then in the 1960s, Desmond and Monica Quinn took it over. The Eight Bells closed its doors for the last time in around 1985. In the 1990s it was the home of the Garden of England Gallery. After the gallery closed the building was incorporated into the Star and Eagle as additional function rooms. The 14th century building is easily identified by the protruding square bay window on the lower floor. It was once a residential and shop premises but is now residential. The 1841 census shows that the residential part of the property was uninhabited It was the same story on the 1851 census. 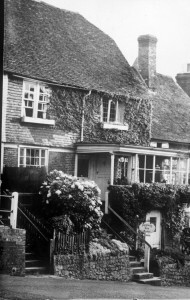 However, a note in the Goudhurst 1935 Jubilee Book states that in 1847 Mr Charles Southon opened a butcher’s shop there with his son David and at the time he was living in a cottage at Winchett Hill. In 1861, Mark Stoakes was on the census with his wife Elizabeth and their two young children. They also had a young servant girl, Fanny Couchman, living with them. Mark Stoakes was a master butcher and, in 1851, he had been living in the household of James Mann, also a master butcher, in New Romney. Coincidentally, in 1861 James Mann was living lower down the High Street, at what is now Bank House, and was running his butcher‘s shop there. By the time of the 1871 census, Mark Stoakes and family had moved on and Walter Price, his wife Mary and their family had moved in. Walter was a farmer of 10 acres. The 1881 census shows yet another change in occupancy. Charles Thomas Collins had moved in with his wife Maria and their three young children. Charles ran a carrier business from the address, going to and fro Maidstone daily, for the next few decades, staying on the census until 1911. Sadly, Charles and Maria’s young daughter Emma died in 1885 aged five years, but another child, William, was born in the same year. By the 1901 census, all of Charles’ and Maria’s children had left home and they had taken in two lodgers. An advert in the Parish Magazine in 1934 shows B & M Thomas running a craft business there under the name of Gazebow Hand Craft Studio. They sold everything from pottery to needlework, glassware to scarves and they claimed in the ad that work by ex-servicemen was always in stock. On November 10th 1945 the property had a new owner and a new name, Spyways. It was being run as a café serving morning coffees and afternoon teas. According to the listing in Burke’s Peerage, in 1952 Edith Emma Wright (nee Smith) the wife of Revd. William Aden Wright lived at Spyways. Their daughter, Sylvia Frances, was made an MBE in 1972 for services as Regional Officer for the WRVS. The next to occupy were Mr & Mrs Millson and their daughter. Mrs Millson died in 1973 at the age of 66 but her widower and daughter stayed on. Spyways is still a private residential property today. In 1851 The Nook was occupied by Benjamin Doust, his wife Anne and three of their children. Benjamin was a yeast seller, buying in yeast from local breweries and selling it on to villagers. Benjamin Doust was also a carrier. In the 1935 Jubilee book, villagers recall Ben using dogs to pull his cart. He was given the nickname “Gee-dog Doust” because he was often heard “gee-ing” his dogs along. In 1861 Benjamin and Anne were still there but with just two children. Then, by 1871, Anne had died leaving Ben with his two daughters. His youngest daughter, Fanny, was a dressmaker. In 1881 Ben had moved to North Road and was living with his oldest and unmarried daughter, Elizabeth. He was 77 years old but was still listed on the census as a carrier. For a while after Ben left The Nook it was uninhabited. The 1891 census shows Benjamin Styles, a gardener, there with his wife Elizabeth, his two step-children and their daughter, Ida. Benjamin had moved from Clay Hill Mount where he had been living with relatives, Charles Brackfield and family. In 1901 Benjamin and Elizabeth were still at The Nook but, by 1911, they had moved to St Michaels, Tenterden where Benjamin was still working as a gardener. The 1910/1915 Valuation Survey shows that Margaret Burfield owned the property and that it was occupied by Lewis Humphries. Lewis’s father, John, owned a drapers and grocers shop in North Road where, according to the 1901 census, Lewis had worked as his assistant. But, by the time of the 1911 census, Lewis had married Amelia and had moved to Lewes where he was running his own business as an automobile engineer. The Nook had been divided into two flats, upper and lower. In 1935 the lower flat was occupied by Mr Edward & Mrs M Hatch who carried on a builders and undertakers business there trading as Hatch Brothers. The 1948 directory shows that Mr and Mrs Hatch were still living there. Also occupying The Nook in 1935 were Mr Dudley John Cadman, his wife Emma Marie and Miss Pearcy Cadman. Dudley Cadman had been a grocer’s assistant in the past so it is possible that he worked in Mr Humphries‘ shop in North Road. Dudley Cadman lived at The Nook until he died on 24 April 1947. Mrs Emma Cadman carried on living there until she died in 1954. The owner of the Nook at this time was Mrs Veronica Wright. Mrs Wright lived in the lower flat and Pearcy Cadman lived in the upper flat. Mrs Wright eventually sold The Nook in 1988 and the new owners lived in the lower flat. 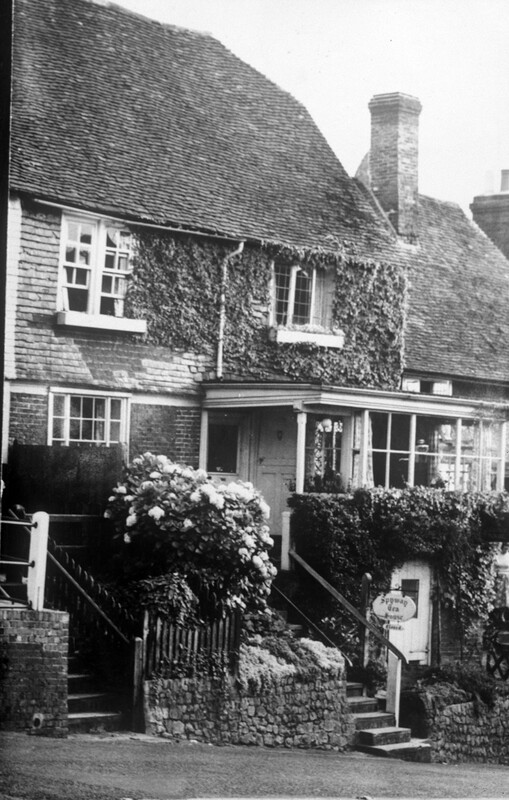 Pearcy later moved to another home in Goudhurst until her death in 1996. In 1995 the flats were made into one house. It has also been renamed Trundles. The 2000 Electoral Roll shows Mr Charles A and Mrs Elizabeth Howey living there while the owners lived abroad. Today the owners have returned to Trundles and it remains a private residential property . In the 1800s the property was owned by Edward Hussey. The 1841 census shows Thomas Hobbs, a tailor, living there with his wife, Sarah, and their family. Thomas is still there in 1851 and his son, also Thomas, is now a master tailor too. His daughters, Mary and Henrietta, are milliners, making straw bonnets, and Hannah is an apprentice milliner. By 1861 Thomas is a widower and he has moved to the Parsonage with Henrietta and Mary. The two girls are still milliners but Thomas, at the age of 67, is shown as a farmer of land and proprietor of houses. In 1871 Thomas, Mary and Henrietta are still at the Parsonage and his older daughter, Jane, is also there and is shown as a housekeeper. Thomas is now shown as a retired tradesperson. The 1861 census shows that there are two parts to the property. William Morris, a tailor, his wife Mary and their family had moved into one part. Mary’s father, Richard Harris the watchmaker, was there too. William and Mary had married in 1837 and were living in Marden in 1841. In 1851 they were living in Bromley. Mary died in 1871 and William stayed on at the house with his children. But, in 1887, William died. The 1861 census also shows that Joseph Crump, a blacksmith, was living at the property with his wife, Emily, and their young daughter, also Emily. They occupied the second part. In 1871 Joseph is still there but with a much bigger family. He now has six children. The 1881 census shows that this part of the property is unoccupied. 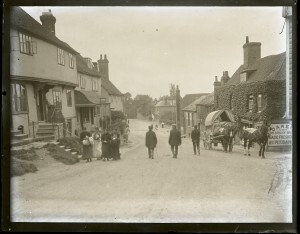 Joseph and his family had moved to Horsmonden. The 1891 census shows John Wilmshurst, a widower and farm labourer, living in one part of the property with his son Charles, daughter Mary Elizabeth and his granddaughter Lizzie. Mary Elizabeth and Lizzie were both dressmakers and Charles was a hairdresser. In 1851 John and his wife, Sarah, had lived in a cottage next to The Vine Hotel. Before moving to the property John and Sarah and their family had lived at no. 4 Workhouse Cottages. Sarah died in 1877. John Wilmshurst died in 1906 and Charles carried on his hairdressing business. In 1911 his niece, Lizzie, was still living there with him and he had a boarder, Henry Mabey, a Methodist Minister. Charles was a member of the Methodist Church in Goudhurst. An article in the October 1919 Courier reports the death of Charles Wilmshurst. It tells us that Charles had been a hairdresser in the High Street for some 33 years, suggesting that his family moved to Alexandra House in 1888, shortly after William Morris died. The 1891 census also shows Frederick Martin, a carpenter, living at the property. The 1910/1915 Land Valuation Survey shows that Charles Wilmshurst occupied the left hand side of the property, and Frederick Martin occupied the right hand side. By 1901 Frederick had married Mary and they had four children. By 1911 they had six children. After Charles Wilmshurst’s death, Frederick Southon moved into the left hand part of the property and opened a butcher’s shop. An advertisement appeared in the Parish magazine in October 1925 showing Fred’s shop in North Road but by December 1925 he was advertising his new premises in the High Street. The street directory of around 1935 shows Miss R Brabon living in the other part of the property. In the 1960s the Greenaway family ran a butcher’s shop here. The right hand part of the property became a separate private residential dwelling and they renamed it Alexandra House. The left hand part of the property continued to be run as a butchers shop until the end of 2013. Sadly it is now vacant. Bank House is believed to have been built in the early part of the 16th century. A recent discovery is the name of John Mace carved into a stone fireplace. John lived in Goudhurst in the early 1600s and his son, Walter, was baptised in St Mary’s Church in 1602. John found himself in Maidstone gaol in 1606 when the parishioners of Goudhurst signed a petition citing the “mysbehayour and evyll Lyfe of John Mace and his wyfe of Goodhurst victualler”. John spent three days in gaol until he was bailed by his friends in the sum of £10.00. The 1841 census shows William Hazelden, a butcher, living here with his wife, Sarah, and his adult children; Mary, Sarah and William, who is also shown as a butcher. William Hazelden is listed as a butcher in Goudhurst in the 1847 Kent trade directory. By the time of the 1851 census William, the father, had died. William, the son, had married Mary in 1843 and was living at Bank House with her and their daughter, Harriett. William’s mother, Sarah, had moved across the street with her daughter Mary and had set up in business as a corn dealer. Sarah died in 1857. By 1861 William had moved to East Peckham and set up a new business there. James Mann had moved into Bank House. The 1858 Kelly’s trade directory lists James Mann as a butcher in Goudhurst so we know he had moved to Goudhurst by then. James, his wife Mary and their three daughters had come to Goudhurst from New Romney. He was a master butcher there and had employed Mark Stoakes, who also came to Goudhurst around the same time and lived at The Gazeebo. The 1861 census shows that James was employing one man and one 13 year old boy in his business, both of whom were lodging with the family. The 1871 census shows James and Mary still at the property but the size of their household has increased somewhat. They had their four daughters, two grandchildren, a servant and an employee there with them. However, by 1881, only James, Mary and one of their daughters were living there with a domestic servant. Mary died in 1890 and James left Goudhurst. He retired and moved to Tunbridge Wells to live with his unmarried daughter, Ellen. Next Mr William E Davis, a farmer and butcher living at Etchinghill with his wife and family, took over the property. The 1891 census shows a William Savage living at the property with his wife, Jane, and their three young daughters. William is shown as a butcher’s manager. Before moving to Goudhurst, William had been working as a butcher’s man and lodging with his employer in Petham. We know from the Valuation Survey 1910/1915 that P J Burfield held the lease on the butcher’s shop from 29 September 1895. The 1901 census shows that William Burfield and his wife Margaret were living at Bank House with their family. They had one daughter, Edith, and two sons, Peter J and William G. William, the father, is shown as a butcher and shopkeeper employing staff and Peter J is shown as a butcher’s assistant. William Burfield had come to Goudhurst from Leigh where he had been a butcher. John (Peter J) Burfield opened a shop at Bank House selling meat, poultry and fish. In 1911 John was still at Bank House with his wife Nellie and his brother William. Burfield Brothers had also taken over the butcher’s shop at the Plain when Mr Ratcliffe retired soon after WW1 ended. Cecil Joseph Remnant, known locally as C J or Joe, came to Goudhurst in 1912 and was a butcher. He married Amy Louisa Gardiner on 7 April 1918 shortly before being called up by the army. His call up came on 10 May 1918 and he was posted to the Army Service Corps as a butcher in the catering section. Amy was a widow and had three children from her previous marriage. Amy opened a sweet shop on the North side of the High Street. After the war Cecil worked behind the counter selling fish, game and poultry. He eventually took over Mr Burfield’s shop at Bank House in 1935. He claimed to be the first person to drive a trade vehicle through the village, a butcher’s van. Amy sadly died in 1947. Cecil married again in 1961. The greater part of his life was spent as a fishmonger until he retired in 1967 aged 75 years. Cecil and his wife Marjorie were looking forward to retirement together with more time for playing bowls, their favourire pastime. Cecil was also a member of the Parish Council for 40 years retiring in 1969. He died later that year aged 77 . Nowadays Bank House is a private residential property. Fountain House is believed to have originally been a cloth hall. The exterior has since been renovated to create the timber framed black and white façade we see today. The earliest records show that the house was owned by the Dean and Chapter of Rochester who leased it as a ‘brewhouse and garden’ to Thomas Mercer in the 1700s. The name derives from the Fountain Head Inn that Thomas ran there. By the early 1800s the inn, now the Fountain Alehouse, had been sold and it appears to have finally ceased trading in the mid 1800s. The house exterior was renovated and the interior divided into several residential units. The 1851 census shows us that Thomas Tickner lived at Fountain House with his wife, Mary Ann, and their seven children. He had moved there from Yew Tree Cottage at some time between 1841 and 1851. Thomas was a veterinary surgeon and druggist and he occupied the left hand side of the property where the box bay window can still be seen today. The right hand part of the property was occupied by Richard Field, a groom at Lidwells, his wife Margaret and their daughter, Sophia. Margaret is shown on the census as a huckster. She sold home made bread, sweets and ginger beer from her home. By 1861 Thomas Tickner had moved out and William Farley had moved in with his family. William had come to Goudhurst from Ticehurst. Richard Field was still living there and his family had increased to five children. Richard is shown on the 1861 census as a domestic gardener and his wife Margaret is now apparently a greengrocer. By 1871 William Farley had moved across the street to the Barracks from where, at 68 years of age, he was working as a town carter. William’s wife, Eliza, his nephew and his grandson were living with him. The new tenant at Fountain House was Charles Sakers who was living there with his daughter Emma and her two sons. Charles was shown on the 1871 census as an outdoor general servant. Richard Field’s family were still there in 1871. Margaret was still running her shop and Richard is a coachman. On the night of the census Richard appeared on the list staying at Lidwells where he worked. By 1881 Charles Sakers had moved to Maidstone, but Richard Field and his family were still there. Richard was still a coachman but Margaret is shown as having no occupation. Ten years later, the 1891 census shows Richard Field, Margaret, their son Richard and their elderly sister-in-law at the property. In 1869, William Burgess, who owned the house and shop next door, had purchased the freehold of Fountain House. Burgess stores was gradually extended into Fountain House and by 1901 the residential parts were totally occupied by the Burgess family and their servants and staff. The front of the house became a part of the shop and the goods on sale were displayed in the windows of Fountain House as well as in the original store. This situation continued all the while business was good. But, in the 1960s business declined and Fountain House was sold. Mrs MacDonald purchased it and opened an antiques business there. Today, Fountain House is occupied by an secondhand bookshop and cafe on one side and a kitchen and bathroom design business on the other side of the ground floor, a hairdressing business on the first floor and a residential flat on the top floor. As with a few other houses in the High Street, Bruton House was believed to have been a Cloth Hall built in the 15th century. Since then it has undergone restoration and extension in the 18th and 19th centuries and reduction and redesign in the 20th and 21st centuries. In the late 1700s and early 1800s Bruton House was owned by the Gilbert family. John Gilbert and before him his father, also John, had been running a successful grocery business from there. 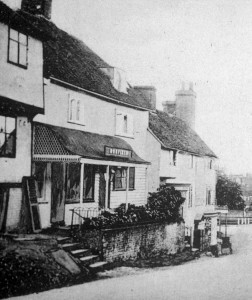 In 1831 William Burgess moved to Goudhurst and took over the business from his brother-in-law, the younger John Gilbert. The business traded as Burgess and Gilbert before becoming simply Burgess Stores. The 1841 census shows William Burgess at the property with his wife, Anne and their three young children. He was trading as a grocer and draper. The 1851 census shows William and Anne with four of their children one of whom was William Chester Burgess aged 11. They had servants and staff living at the property too. The 1861 census shows the 26 year old William Chester Burgess living there with his wife, Frances and their two children, Frank and Louisa, and a number of servants and staff. In 1869 William Chester bought Fountain House, the property adjoining Bruton House. In 1885 work was under way to enlarge the shop. The warehouse was incorporated and the shop was extended into Fountain House and a new warehouse was built at the back. The original shop front was brought forward nearer the street, some new windows were put in and a veranda was created. In 1871 and 1881 William and Frances were still there with their now six children and their servants and staff. Then, in 1888, William Chester took his son, Frank, into partnership with him. William Chester moved to Green Trees leaving Frank and Nellie living at Bruton House. William Chester died at Green Trees in 1902. Frank continued to run the business until he died in 1922. Frank’s trustees, Victor and Cecil Burgess, took over the running of the business together until Victor died in 1955 leaving Cecil as sole trustee. Nellie died in 1957 and Cecil was reluctant to go on running the business. He allowed the buildings to fall into disrepair and in the 1960s the County Council threatened to close the business down on health and safety grounds. Eventually, in 1962, the founder’s great great grandson, Geoffrey, took over the business and he sold off part of it. He sold the ironmongery and china shop to Mr Grainger and Fountain House was sold to Mrs MacDonald who opened an antiques business there. He then set about restoring the image of the stores. Having brought the business back to life, he sold it in 1971. The business was then in the hands of Mr & Mrs Charles Lucking until 1973 when Mr & Mrs Maurice Gee bought it. In 1975 Kenneth and Barbara Johnson bought it. Sadly, Kenneth died in 1993. Barbara carried on there until she retired in 1995 and sold the business to John and Elaine Maxwell-Jones. John and Elaine eventually retired in 2012 and sold the business. After 170 years of trading the new owners decided to change the name to Goudhurst Village Store. Following the latest change of ownership in 2015, an official opening on Saturday 20th February 2016 confirmed that the name of the shop had reverted to Burgess Stores.